↑ China is the short form name used internationally. 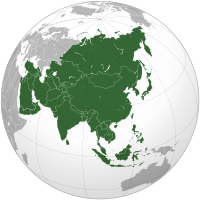 ↑ २.० २.१ Some territory could be argued to be a part of Asia or Oceania. ↑ Jerusalem Law states that "Jerusalem, complete and united, is the capital of Israel", and the city serves as the seat of the government, home to the President's residence, government offices, supreme court, and parliament. United Nations Security Council Resolution 478 declared the Jerusalem Law "null and void" and called on member states to withdraw their diplomatic missions from Jerusalem. The United Nations and all member nations maintain their embassies in other cities such as Tel Aviv, Ramat Gan, and Herzliya (see the CIA Factbook and Map of Israel). The Palestinian Authority sees East Jerusalem as the capital of a future Palestinian state. ↑ Also known as East Timor.